The drive will encourage consumers to try the new variety by highlighting that it ‘tastes more like Coke and looks more like Coke’ than Coke Zero – which was itself developed to be closer to ‘classic’ Coke than the brand’s original sugar-free product, Diet Coke. CCGB described the move as a “deliberate attempt to change the mix of our portfolio between sugar and no sugar drinks” – which became a much more pressing concern for the business when George Osborne announced the so-called ‘sugar tax’ in last month’s budget. The levy, due to come into force in 2018, will see soft drinks containing more than 5g of sugar per 100ml charged a flat amount per litre of product packaged for sale – with a higher rate for drinks above 8g per 100ml. “For years we have offered people a choice – every brand we sell has a great tasting no sugar version,” said CCGB general manager Jon Woods. “Since 2012 our commercial strategy has focused on accelerating the growth of our no sugar options. Today’s move will be seen as an acknowledgement that efforts to move classic Coke drinkers over to Zero have not delivered. According to data from IRI, Coke Zero’s value sales declined over 2015, while its volume sales went up, meaning the company shifted more packs by putting them on promotion. Last spring, CCGB launched the ‘One Brand’ strategy, which aimed to unify the identity of the Coke range and more closely associate the sugar-free products with red Coke. 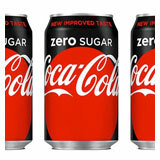 The strategy was launched with a campaign that was led by Coke Zero for the first time. Sales of Coke Life, meanwhile, have also dwindled since it launched in 2014 as the first Coke product to be partly sweetened with stevia – and in January the company unveiled a product overhaul, with the sugar content further reduced to 45% lower than standard Coke. Each of the four will now feature a large red disc – a prominent element of the global campaign ‘Taste the Feeling’ which began in January. Cans and bottles with the new design will feature smaller areas in silver (Diet), black (Zero) and green (Life). “Packaging is our most visible and valuable asset,” said Marcos de Quinto, chief marketing officer at The Coca-Cola Company.